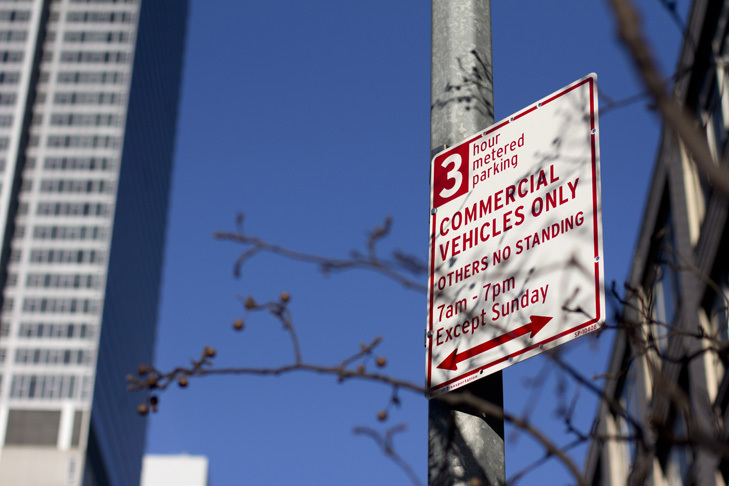 New York City hired design firm Pentagram to create new parking signs. That seems appropriate, as the pentagram is the sign of the devil, and parking in Manhattan can be sheer hell. The 6,300 new signs deliver information in 140 characters or less, roughly half the verbiage of the old signs. Good idea, because squinting at signs longer than a tweet can get you rear-ended in midtown. Using the Interstate typeface, information is displayed in green and red sections, for passenger vehicles and commercial transport, respectively. Each section begins with a large numeral indicating the number of hours parking is allowed in that particular zone. Predictably, reaction has been mixed. Some applaud the signs' simplicity, while others say the wording is now too vague—or bemoan the fact that NYC's parking rules weren't overhauled instead. Richard Paris, a WWE executive, grouses in the Observer's comments section: "The typography weighting and layout feels strangely uncomfortable." Baby. Overall, the new signs do seem easier to read, but why go through all this trouble when most folks will just ignore them anyway? Personally, I'd show a car with a slash through it and the single word "Fuggedaboudit!" Why am I not consulted on these things? More images, including a before-and-after comparison, below. First two photos via. Third photo via.